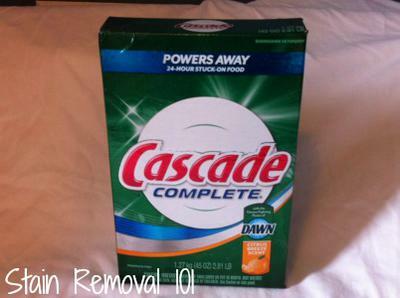 I've now almost finished my box of Cascade Complete powder dishwasher detergent, in the Citrus Breeze scent. I know, I know, I have always been so loyal to Walmart's powder detergent, but I realized it was silly for me to stick with one kind when I could be trying a bunch and then reporting my results to you guys, just like I do with so many other cleaning products. So, I got brave and tried this brand. Well, honestly, I decided on this one first since the Great Value brand actually says to compare it to this name brand. I bought the smallest box they had, and it still has taken forever to even finish this box because we also use LemiShine dishwasher detergent additive, so we add much less powder detergent than before to each dishwasher cycle. Overall, I do think this works well. It got the dishes clean, which is the whole purpose of the stuff after all. However, I don't think it worked any better than the generic version (from Walmart), although it worked much better than Target's generic version by far! It did not leave any noticeable film on the dishes. Further, it did seem to, in general, clean the dried on food on the dishes pretty well, although we are a pre-rinse type of family. We have had several instances lately of food still being on dishes when we unload the dishwasher, but I don't think this is the fault of the detergent. Instead, I think this has to do with the dishes and silverware not all getting sprayed by the jets, but that is a separate issue we're having right now because I'm trying to teach the kids how to load the machine properly and let them take over this chore more. We've had some mishaps, but I think with time this will make my life easier. think I'll do that again. It may be because we also use LemiShine, which is citric acid based, but I always seem to have a slight citrus scent left on the dishes afterward which I find disconcerting when wanting to eat off them, or drink from a cup. It doesn't leave an aftertaste, but I don't always think it blends well with the food or drink I've chosen so I don't like the lingering smell. I would think the scent would only be something you'd want while you're actually washing your dishes, emitting from the dishwasher slightly. I never noticed a lingering smell on the dishes when using the fresh scent instead. Finally, this product is touted as having the "grease fighting power of Dawn." I think this is just a gimmick from Procter & Gamble, to allow two big brand names to team up to try to get more people to buy the product. Overall, I probably won't buy it again, just because as a name brand it costs significantly more than the generic version from Walmart, so why pay more? Of course, if there was a huge sale and I had coupons that made it cheaper than buying a store brand, yes I would buy it again -- but not with the citrus scent. I'd choose a different fragrance instead. Has anyone else used any of the Cascade Complete products? I've got several reviews from readers of the Action Pac version of this product here. How about more powder or gel reviews though of this brand? I would love to hear your thoughts. You can share your review here of this brand, or any other, or also read other reviews already submitted (I've got lots of brands and types already represented).